Steve Kang, dean of the Baskin School of Engineering at the University of California, Santa Cruz, has been awarded the 2005 Mac Van Valkenburg Award from the Institute for Electrical and Electronics Engineers (IEEE) Circuits and Systems Society (CAS). The Van Valkenburg Award is the CAS society's highest honor and is given to a person who has made outstanding technical contributions in a field within the scope of the society and demonstrated outstanding leadership in the field. Kang received the award at the 2005 IEEE International Symposium on Circuits and Systems in Kobe, Japan, on May 25. The society recognized Kang "for fundamental contributions to VLSI design and design automation, and for leadership in education and within the IEEE Circuits and Systems Society." The award includes a plaque and a $2,000 cash prize. Kang, a professor of electrical engineering, came to UC Santa Cruz in 2001 from the University of Illinois at Urbana-Champaign, where he was professor and department chair of electrical and computer engineering. His research interests include computer chip design (specifically, methods of very large-scale integration, or VLSI) and optimization of chip design for performance, reliability, and manufacturability; modeling and simulation of semiconductor devices and circuits; high-speed optoelectronic circuits and fully optical network systems; and nanoelectronics. He holds over a dozen patents, has published more than 350 technical papers, and has coauthored eight books. From 2002 to 2003, Kang served as president of the Silicon Valley Engineering Council. He is a fellow of the Institute of Electrical and Electronics Engineers (IEEE), the Association for Computing Machinery (ACM), and the American Association for the Advancement of Science (AAAS). Kang is also a chaired visiting professor of electrical engineering and computer science at the Korea Advanced Institute of Science and Technology. 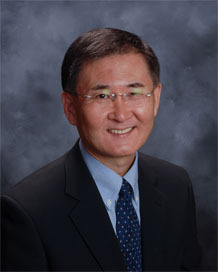 He is a foreign member of the National Academy of Engineering of Korea and the recipient of numerous national and international awards and honors.